(b) Temporarily Closed Runways. For runways that have been temporarily closed, place an X at the each end of the runway directly on or as near as practicable to the runway designation numbers. Figure 2-1 illustrates. (c) Partially Closed Runways and Displaced Thresholds. When threshold markings are needed to identify the temporary beginning of the runway that is available for landing, the markings must comply with AC 150/5340-1. 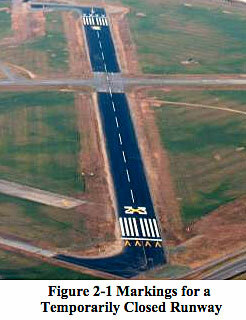 An X is not used on a partially closed runway or a runway with a displaced threshold. See paragraph 207.a(1) above for the difference between partially closed runways and runways with displaced thresholds. (i) Partially Closed Runways. Pavement markings for temporary closed portions of the runway consist of a runway threshold bar and yellow chevrons to identify pavement areas that are unsuitable for takeoff or landing (see AC 150/5340-1). (ii) Temporarily Closed Taxiways. Place barricades outside the safety area of intersecting taxiways. 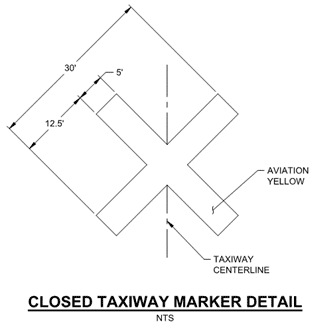 For runway/taxiway intersections, place an X at the entrance to the closed taxiway from the runway. If the taxiway will be closed for an extended period, obliterate taxiway centerline markings, including runway leadoff lines, leading to the closed section. If the centerline markings will be reused upon reopening the taxiway, it is preferable to paint over the marking. This will result in less damage to the pavement when the upper layer of paint is ultimately removed. (e) Temporarily Closed Airport. When the airport is closed temporarily, mark all the runways as closed. 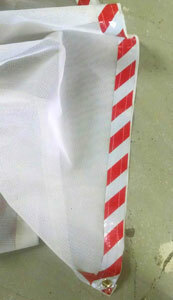 Storage Bag - Red Cordura for (1) Airport Runway "X" Safety Marker (90#'s). All combinations come with a bag per 'X' for storage and ease of transportation. 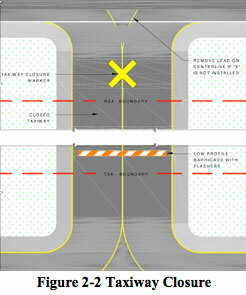 Note: Diagram shows 3 chevrons to better illustrate proper partial closure of a runway.